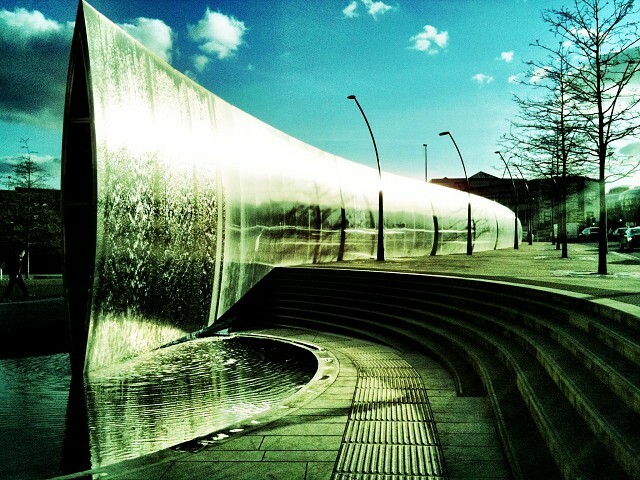 I don't think you'd find too many Digital Specialists around if it was still the Industrial North... Never been to Sheffield before, but was pleasantly surprised to be greeted at the railway station by some civic sculptures/water features and a plethora of bike routes - wish I'd brought my I had a bike. There seems to be a lot of regeneration going on, lots of new buildings and signs by old ones showing the revamp they'll be getting (if the money's still there). And on the way over to the hotel, got a great look at the largest listed building in Europe, which looked particularly impressive in the setting sun. Had a wander round the city with a sometime blipper, romantic dinner for two, then a pint in a local boozer. I like cities, yeh yeh, I know, but I do. I like buildings, stuff, things happening, that kind of thing, and I liked the many levels of Sheffield - ramps everywhere, overpasses, underpasses, elevated tramlines, and so on. Oh, and while we're on the subject of tramlines, here's something us 'burgh locals won't be seeing anytime soon.